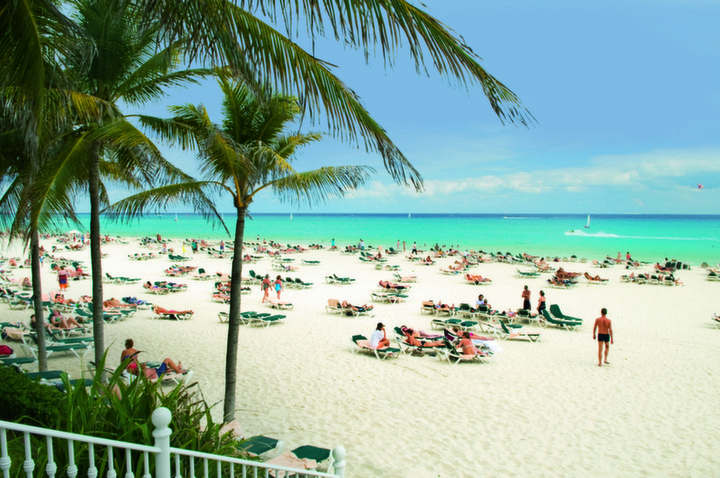 Refurbished in 2013, the RIU Yucatan has become a leading name for resorts in Mexico, especially for the resorts near Playa del Carmen and Playacar. Though the entire resort received a total makeover, the resort lobby may have been improved the most. What was once an aged lobby now resembles a top notch nightclub vibe, which has been grabbing the attention of guests from around the world. Hot pink dominates the entire lobby, from the furniture to the walls, there is definitely an electricity in the walls of the RIU Yucatan. Elegant silver sculptures and orbs accentuate the hot-pink walls and skylights, while the resonation of vibrant music fills the resort with a positive, beach-club style vibration. The amazing trip you’ve been waiting for! You may wonder how the RIU Yucatan is able to provide an atmosphere that can house so many different styles of groups. This is made possible by the incredible and vast size of the resort. 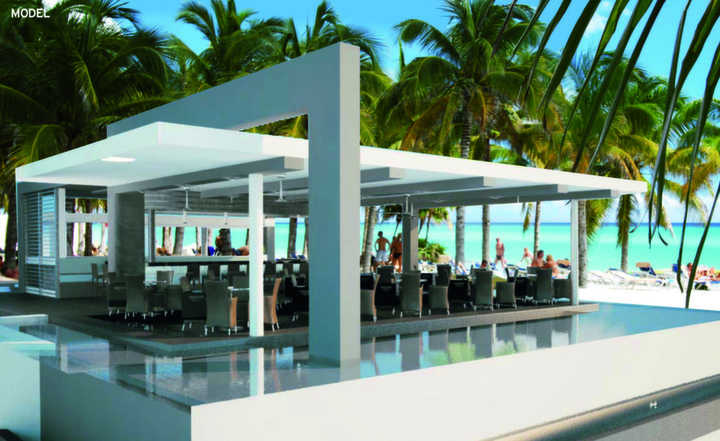 With several different sections, restaurants, pools, and wings, the RIU Yucatan is able to make an environment that allows hundreds of different people enjoy their own vacation while never having to avoid a specific section of the resort. Within walking distance to RIU Palace Mexico and about 30 minutes away from RIU Palace Las Americas, RIU Yucatan Resort has one of the best location in Playacar. 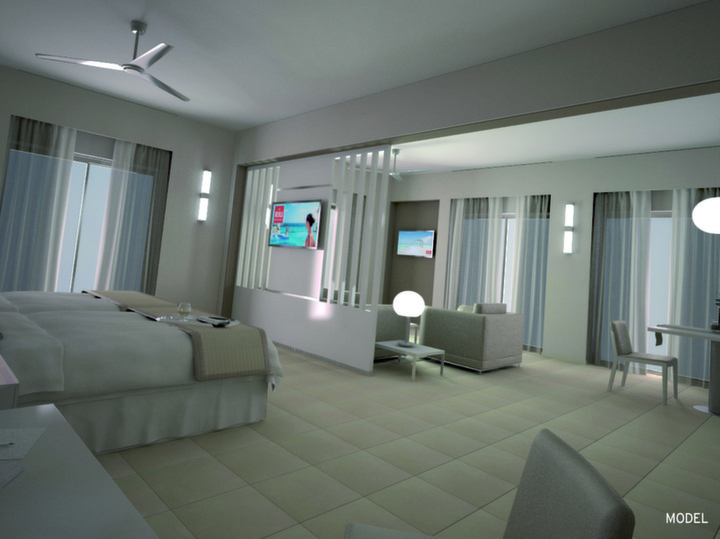 As a RIU Resort, you as a guest are treated to all the amenities of nearby RIU resorts without an additional charge. Though specific accommodations will cost you extra, the majority of resort amenities are readily available to anyone with an RIY resort wristband. The RIU Yucatan Resort offers 507 air-conditioned rooms and suites, separated by hacienda-style, two story clocks through the resort and despite housing hundreds of different guests per week, the RIU Yucatan remains one of the cleanest resorts in the country. Staff ensures clean rooms and suites with mini-bars stocked with free drinks and liquor dispensers. The rooms are spacious, comfortable, and properly ventilated, allowing you to feel like you’ve never left the comfort of your own bed as you vacation to Mexico. The standard rooms have two beds, or one king, liquor dispensers on the walls, a bathroom, tile floors, white painted furniture, dark blue curtains, folded towels, flat screen TV, mini-bar, WiFi at an additional cost, walk-in shower, private water closet, hair dryer, private balconies, and much more. While the standard room is going to be a great option for singles, couples, and college students, families may want to upgrade to a suite. Suites include much more space, larger balconies, the decor is more attractive, a separated living room, more furniture, whirlpool bathtubs, double sinks, and a variety of more upgraded amenities. When you choose Hotel RIU Yucatan all-inclusive as your vacation accommodation you are going to be amazed by the variety of restaurant, drink, and activities that are available at your disposal. 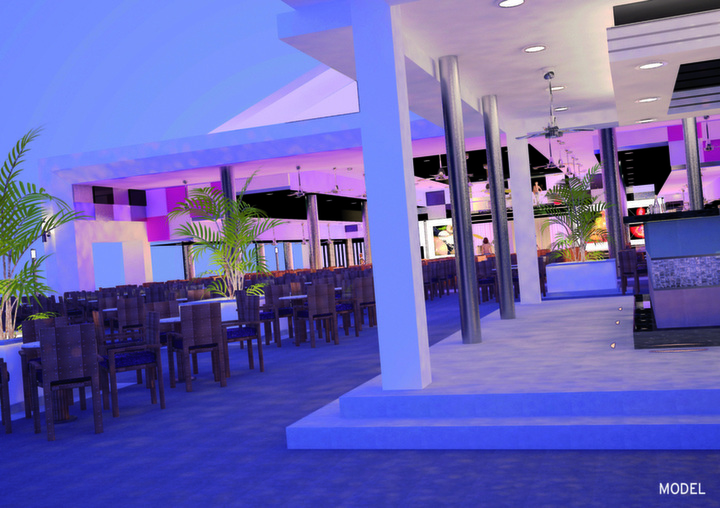 It includes four restaurants, which feature a variety of different culinary choices for guests. Try the Hacienda Restaurant, where diners are able to enjoy their meal amidst the jungle canopies of the area, or if you’d prefer a more informal dinner, Margarita’s specialty restaurant is a superb idea. You can dine next to the large swimming pool area, choose from numerous options at the buffet, and enjoy a night full of strong cocktails and laughs with your family or friends. In addition to the dining options, guests are able to participate in several different activities while they vacation at RIU Yucatan. Play a game of tennis on one of the three lit-up courts, test your skills on a kayak or body board, shoot a round at the 18-hole golf course, sooth those rusty joints at the Renova Spa, or catch an exciting show of music and dance to cap off the night. Though the RIU Yucatan Resort offers a ton for guests to do, the real benefit of the resort is its location on the pristine beach of the area. 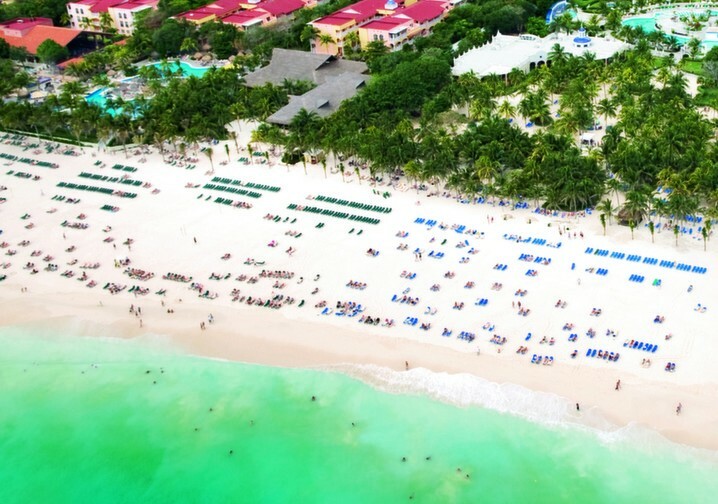 This wide stretch of white sand is perfect for couples to soak up some Mexican sunshine, or for college students to spend hours of partying. Also, non-motorized water sports are always available for guests of RIU Resorts, so it’s simple to take out a paddle board, snorkel gear, or boogie board. Being located away from Cancun resorts, guests won’t have to worry about being heckled by beach vendors because the Playacar is much more laid back. If you are looking for an upper-class resort with a more young, vibrant atmosphere, then the RIU Yucatan is a great option for your next vacation. Though you receive slightly less amenities at the surrounding RIU resorts than other resorts, the RIU Yucatan has a variety of its own advantages. We wouldn’t recommend this resort for honeymooners that want a ton of peace and quiet and romantic settings during every part, but if you are up for a little fun, then this resort may fit you well. It’s an all-inclusive resort, so everything you eat and drink will have already been paid for through your vacation packed deal. A vacation should be a time when you get to kick back, let loose, and dance until the sun comes up. The RIU Yucatan delivers a powerful punch of late nights, smooth drinks, and unlimited sunshine, so start living the RIU Yucatan lifestyle and book your trip today!